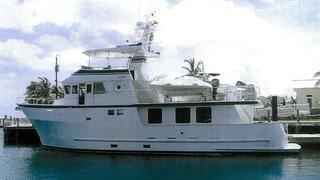 I am informed by Tim Johnson at Ardell in Fort Lauderdale that the 24.4m motor yacht Lora, listed for sale back in August, has just had $300,000 shaved off her price. Built by Northern Marine in 2002 as an expedition superyacht, Lora has a dark wood interior, which sleeps eight guests in three cabins, and is fitted with a hardtop on her flybridge. Endowed those all-important zero speed stabilisers, the yacht also has three generators. Lora is now asking $3.95 million.